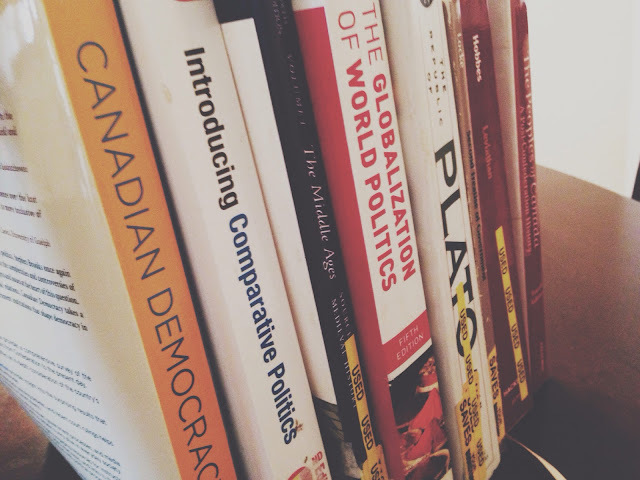 Look at some of the textbooks I spent copious amounts of money on and will never look at again. Alas, a new school year has come and gone, what an interesting school year this was. Pathetic fallacy, I always thought it was an unnecessary concept we were forced to learn in english classes throughout high school but I have realized recently that the way you remember an environment can affect the way you remember a moment. A few weeks ago I wrote my last exam of my second year of university. It was Political Theory, a mandatory class for 2nd year honour political science students and entailed analysis of five quotes and 2 essays on famous works of Political thinkers. I don't know how that sounds to people unfamiliar with political theory, but it really wasn't too bad. It's funny to think I am done with this school year, in all honesty the days leading up to the end of the year (I'd even go as far as saying that last year) has seen me at an extremely low point. Yet, as I walked out of my last exam, feeling relatively comfortable with the outcome I couldn't help but note how sunny it was outside. The sun was shining and I could feel the warmth against my skin and as I walked off campus for possibly the last time for a very long time I thought "this really hasn't been so bad,"
Except it has been bad, in fact it has been terrible. In all honesty I can't begin to describe how intense this year was for me. The amount of work I put into ensuring my grades would be good enough for exchange is indescribable. 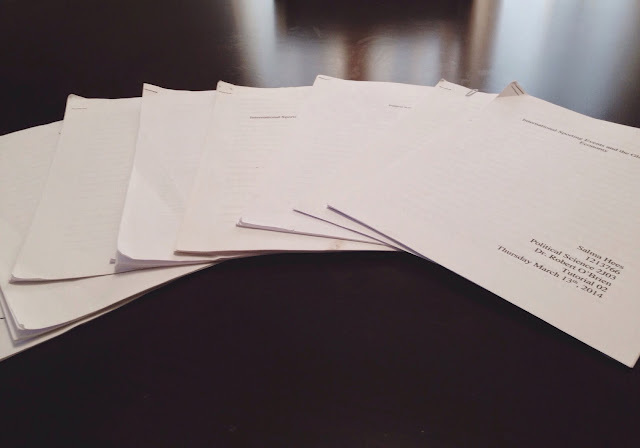 Below are some of the major research papers I wrote second semester alone. During the last four days of the exam season I wrote three exams. I've shed a ridiculous amount of tears and attempted to find emotional support in anywhere I could. Of course it doesn't help that anyone who is in the same boat as me refuses to discuss their sentiments, and everyone else is either complacent with their academic outcome or just really don't care. Neverthless, the ball is out of my court and there is literally nothing I can do to change the course of my next year. It is either Durham accepts me, or they don't. There is nothing I can do to change this. I do however, want to remember that moment of warmth. The positivity felt in concerning oneself with nothing but the relaxation summertime would embody. It was so good. It is so easy I think, to look at my first two years and university and note how difficult its been, how much I've struggled or doubted my life choices but has also been a gift. There are so many people and memories I wouldn't have come across in the last two years if I had second guessed myself. Still, I am done my second year, I am half way to a degree and am hopefully three months away from going to the school of my dreams.